This method of building a corner is unique to GeoStone due to its open core technology. Most people ask, why we don't have a corner block and the answer is simple. With GeoStone, you don't need it. Corner blocks are ALWAYS from a different run as the rest of the block in the wall. Either the corners were made a long time ago and have been sitting (aging/fading) or they have to be made which will cause delays or worse, a combination of the two!! Corner block usually have to be sawed in the field to fit the running bond so our method of making corners out of the block you already have only makes more sense. This method gives the wall a natural look more like chiseled rock and with no ridiculous looking seams as with a 45° miter cut corner. 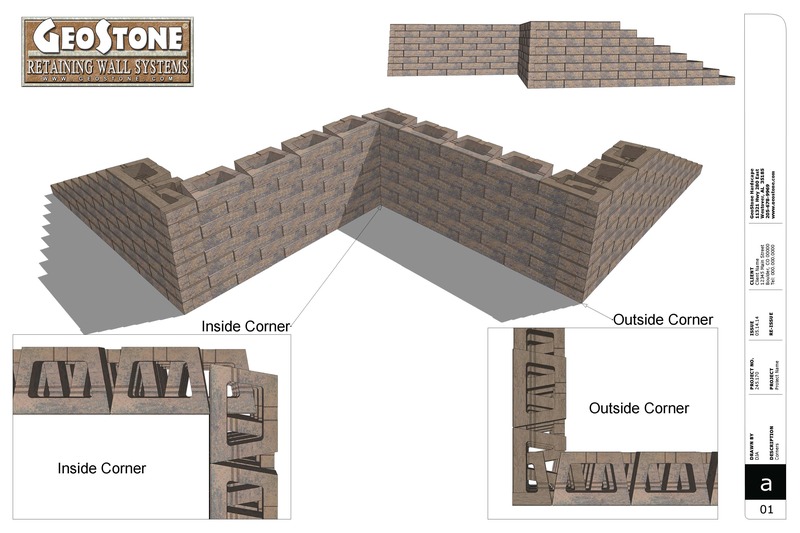 In order to maintain the required running bond, a structural corner must have the correct offset to correspond with the courses above and below. This particular corner method allows for this to be accomplished very easily. Just remember “HALF-WHOLE”. One side of the corner needs to be HALF the length of a block’s face, the other side of the corner needs to be the WHOLE length. As shown above, the Half-Whole method allows the running bond of the wall to be maintained. The look of this style corner is more in line with the overall look of the rest of the wall. GeoStone's Half-Whole method for creating an outside corner is unique due to its large open core design. Are very simple. Shown above, interlace the blocks, alternating on each course. Sometimes wall batter will throw this alignment off. Do not worry. It is very common to cut block to fit in corner applications. As a matter of fact, this is the place you will want to make such adjustments as they are not as easy to notice.